In the great city of Varanasi, there lived a weaver of threads and words, who sent out his poems like incendiary drones into the comfortable world of the Kazis and the Brahmins, neither of whom had much liking for Kabir. Legend has it that the Kazis and the Brahmins went to the new emperor, Sikandar Lodi, asking him to rid them of the troublesome weaver. Lodi was merciful; instead of executing Kabir, he merely banished him to Maghar. Silenced, distanced, the weaver no longer made the deeply pious uncomfortable by his very presence. What is striking about this legend, collected by Sabyasachi Bhattacharya in his introduction to Rabindranath Tagore’s selection of 100 Kabir poems, is not so much the injustice done to Kabir – hounded out from the city in which he has lived all his life, scorned and his poetry reviled. That is obvious; but what is interesting is the certainty of the upright that casting him out was the right thing to do. Kabir’s verses are not invoked as often as they should be in today’s India, which is a pity, because their fire is undimmed by the passing of time. In contemporary India, we blame those whom we banish for their fate. The politician Mani Shankar Aiyar argued in a 2013 interview that it was the responsibility of writers, artists and thinkers to make their speech acceptable; or else they should bear the consequences of saying things that might be misunderstood. In February 2014, he wrote that authors like Salman Rushdie should suffer the consequences of writing “blasphemy for blasphemy’s sake”. Mr Aiyar held up Rajiv Gandhi as a model of mercy because “he did not seek to murder the blasphemer”, unlike the Ayatollah. He topped this with NRI-bashing, suggesting Mr Rushdie’s motive for writing The Satanic Verses was to “curry favour with the aliens among whom he chooses to live”. Then this April, Chetan Bhagat settled an old score when he said that Mr Rushdie was not widely read in India (his books were, by implication, not as influential as Mr Bhagat’s own books) and that he was better known as a celebrity. Aside from that curious echo, from Kabir’s time to our own – the same complaints aired centuries later against another writer seen as a dangerous arsonist – there is reason to examine these grievances. Mr Aiyar’s arguments against Mr Rushdie are a defence of the Congress import ban on The Satanic Verses, which set the tone for two decades of rising censorship in the country. If we face free speech curbs in India today, you can thank Rajiv Gandhi’s government for creating that precedent. As the author Siddhartha Mukherjee said in a lecture recently, first they came for Mr Rushdie, then for the rest. But Mr Aiyar and Mr Bhagat are not alone in attacking Mr Rushdie for his “celebrity” status: many have made similar attacks when Mr Rushdie has been threatened and prevented from travelling to various Indian cities. If you can prove that beleaguered artists and writers like Mr Rushdie are not serious writers, just celebrities who like to provoke, they become unworthy of defence. At the core of Mr Bhagat’s dismissal of Mr Rushdie is the belief that his sort of writing is irrelevant to our times. This is saddening, in part because Mr Bhagat is representative of his generation. In rejecting Mr Rushdie, they reject their own literary history; in calling Mr Rushdie irrelevant, Mr Bhagat makes amnesia respectable and refuses to claim his own legacy as a writer. In order to believe any of these arguments, you have to agree not to read Mr Rushdie, just as in a previous century, the good people of Varanasi agreed not to read Kabir. Reading Mr Rushdie would be an uncomfortable experience for mainstream populists and liberal bigots alike. In Shame and in Midnight’s Children, Mr Rushdie examines the founding myths behind India and Bangladesh, shines his light on the people the state prefers to forget, calls a spade a spade and a tyrant a bloody despot, and creates magic out of these brutal histories. In Step Across this Line, he makes the case for free speech with eloquence and passion, as he has in his decades of work for PEN. In many of his other essays, he claims the right to explore all of the world’s myths and heritage as a writer – including the stories that religion likes to tell itself. 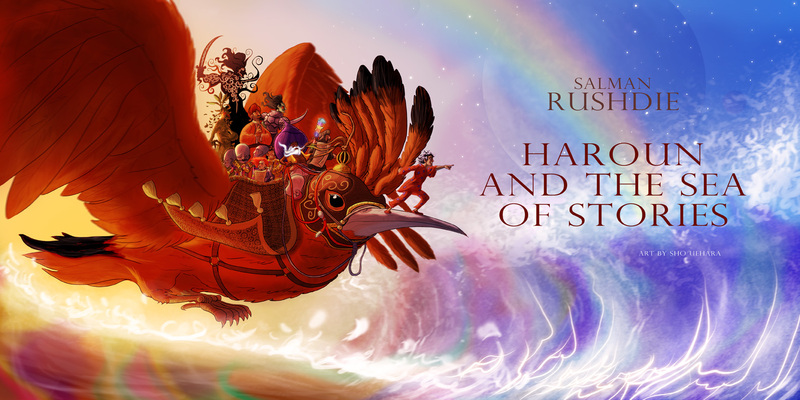 I have less fondness for Mr Rushdie’s later works, but reading his detractors made me return to his 1990 classic, Haroun and the Sea of Stories. It reads like a parable of our times: Khattam Shud and the land of Chup, which likes order and has no use for stories, pitted against the colourful but unmartial anarchy of the land of Gup. Mr Rushdie’s story has a happy ending: Khattam Shud melts away when the light shines strongly on him, the good guys win, and the Ocean of Seas of Stories is unstoppered forever. But Haroun and the Sea of Stories does not reflect the reality of an anti-intellectual India that prefers to banish or ignore its most creative minds. The world where the ocean of seas of stories flows untrammelled is fictional; the win of Gup over Chup is, sadly for India, in the realm of fantasy.